Okinawan Shi-sa are beasts of legend. They are believed to protect houses from various evils. 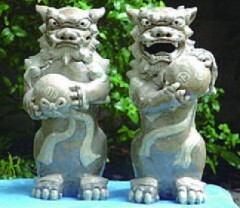 Shi-sa with its mouth open is the male who wards off evil spirits while the one with the mouth closed is the female who keeps happiness in the house. People often place shi-sa on rooftops or flanking the entrance of the house.